It’s been about two months since I received the Total Gym XLS, and the results have been pretty remarkable. Despite a minor back injury that forced me to adjust my workouts accordingly, I still managed to hit my goal for this month, dropping another 5 pounds and bringing me down to a weight that I haven’t been in YEARS. But the numbers don’t always tell the whole story. Theoretically, it’s possible to lose 5lbs of fat and gain 5lbs of muscle, yet the scale wouldn’t show any change in body weight. So don’t get fixated on your weight, and instead focus on how you feel. I’m able to wear some clothes in my closet that haven’t fit me in years, which shows me that my workouts are working. And that’s really motivated me to keep at it. Some readers asked me how I planned on working through my back injury with the Total Gym, given the fact that there aren’t any weights involved. It was actually quite simple. Since the Total Gym uses a percentage of your body weight, it’s completely adjustable to the needs of the user. 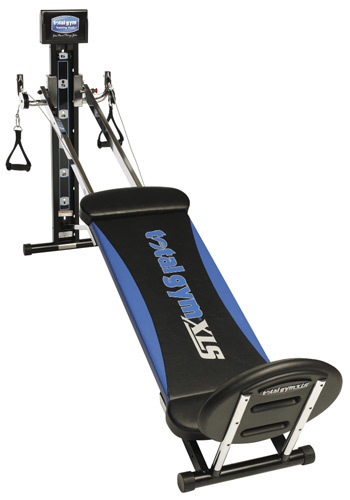 The Total Gym XLS uses a variable-angle incline plane to create exercise resistance by modifying your body weight – The steeper the angle, the more resistance. For example, a 150-pound person using Level 5 would be lifting 66 pounds. And if the pulley cables are used in the exercise, the person would be lifting 50% of the weight, so in this case 33lbs. If they dropped the Total Gym down to Level 1, they’d only be lifting 18lbs. And with the pulley cables, they’d only be lifting 9lbs. So by putting the Total Gym on the lowest level, I was able to reduce the amount of weight I was lifting, which allowed me to ease my way back into my workouts without overdoing it. In addition, the Total Gym has proven to be a great machine for stretching, which has helped to improve my flexibility and get me back on track faster. In the following video, Tom shows you how to use the Total Gym to help stiff backs and other weary body parts that could use a great stretch. With beach season rapidly approaching, you better believe that I’ll be hitting the Total Gym XLS extra hard. July’s progress update should be a good one! everyone body is different. Remember too if you dceide to exercise you have to use your activity points calculator to determine how many extra points you get for the day. But everyone’s body loses weight at a different rate. Someone who jogs everyday while on weight watchers for two weeks could lose 5 lbs where are someone else could lose only 2. A bunch of different things factor into this including what you are eating everyday, how much activity you are doing, how fast your body reacts to exercise (some people need to exercise only days before seeing results while others need to exercise a month before seeing results) how fast your body gains muscle mass, how much water you are drinking, how much water your body retains after exercise and so on and do fourth so there is no way of knowing how much you will lose but cardio IS the best form of exercise for burning fat. Just make sure you are at least doing moderate exercising meaning you are pushing yourself but not too hard (just hard enough that you start to sweat after about 10-15 minutes) and doing at least a half hour of exercise each time.